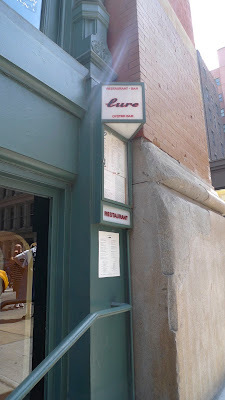 I went to go visit Pete in New York last month and I always face a conundrum when I am there. I have limited time and there's too many places to eat. So when Pete asked what I wanted to eat for lunch on Saturday, I had no clue. Luckily Pete suggested lobster rolls. It's hard to say no to lobster rolls, so off we went to Soho to Lure Fishbar. I should have taken a picture of the inside for you, but it's right along a busy street, but inside, you feel like you've stepped inside a ship cabin, very titanic-esque. We started off our brunch with some bloody mary's. I was intrigued by their Bloody Mary Royale. 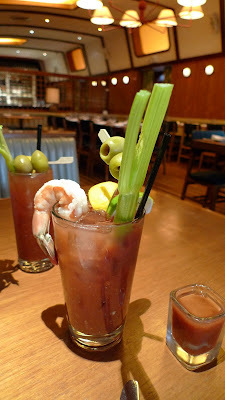 It was basically a larger version of their bloody mary with a gigantic shrimp garnish and an oyster shooter. You can see Pete's bloody mary in the background. What a glutton I am. But it sure was tasty! I'm a sucker for corn soup and this happened to have lobster in it. Do you see the running theme here? What's next? Lobster on a crouton? Turns out, it's on their menu as well. lol. 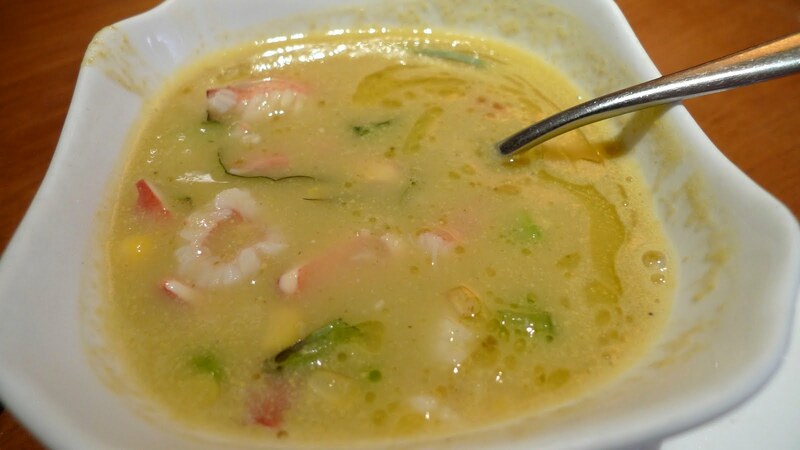 I thought the soup would be mostly corn soup with maybe a lobster claw on the top as garnish, but as you can see, it was swimming with lobster pieces. It wasn't creamy, which I actually liked and the touch of basil oil added a nice herbiness to the sweet corn soup. I actually asked them to split the soup into two for Pete and me, so this was just my portion. I can't imagine what a full serving would have been like. For our meal, we got an order of Mahi Mahi fish tacos with pineapple, corn and spicy mayo. 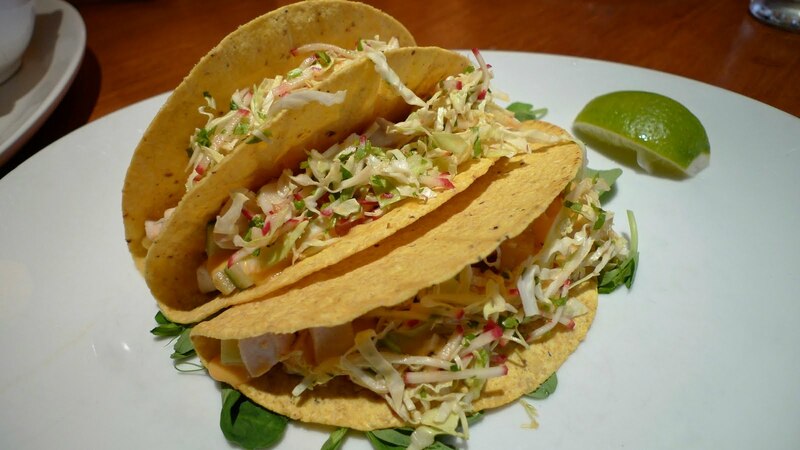 I'm accustomed to fish tacos on soft corn tortillas. I've never seen a fish taco served in a hard shell, but my problem with hard shells is that often times the crunch is oftentimes so overpowering that it doesn't even matter what's inside the shell. As I write this now, I remember I liked the crunch of the shell and the sliced radishes, but I don't remember the mahi mahi at all. Case in point. 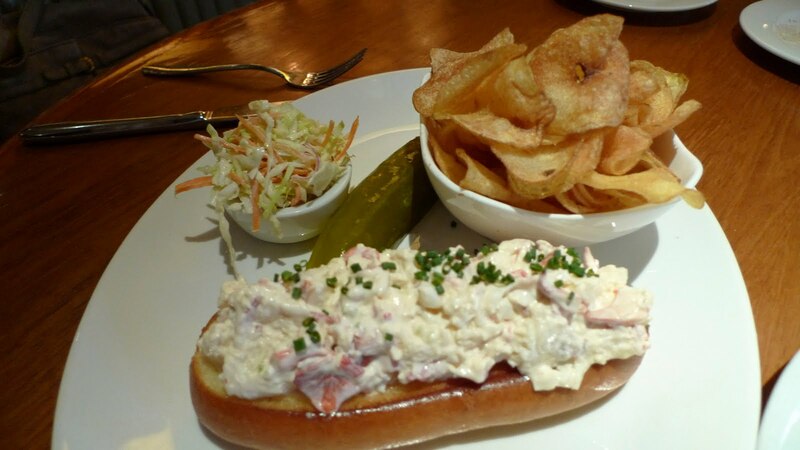 Now, for the reason why we came here in the first place, their lobster roll. I don't know when was the last time I had lobster rolls, but having lived in Southern California for the past several years, I've never really thought to order lobster, because I just associate lobster with Maine and the east coast. Why order something that takes so much trouble to ship, when we have plenty of other great things to eat in California. So sorry Mr. Lobster, but you haven't been missed ... until now. Lure Fishbar's lobster was piled high on a lightly toasted and buttered brioche roll. It came with a vegetable slaw, pickle and salt and vinegar chips. 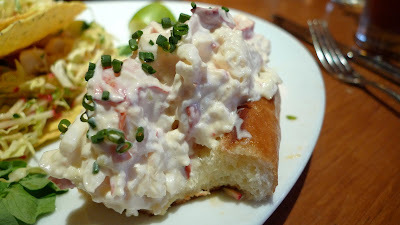 Here's a closeup of the lobster roll. Chunks of perfectly cooked lobster with just enough mayo to bind it all together. It wasn't overly complicated and rightfully so, lobster doesn't need much dressing up to impress. Just a little butter and mayo is all it needs. Pete always spoils me when I'm in NY, but that's what keeps me coming back for more. Thanks Pete! Till next time.